The first Italian Living Lab, organized in collaboration with Associazione Industriale Bresciana (AIB), was held on 10 November 2017. The full summary of the event is now available. The First Italian Living Lab was held in Brescia at the AIB headquarter on 10 November 2017, with the aim of presenting the project and addressing issues related to the industrial symbiosis, with focus on the steel, construction aggregates, and concrete sectors. 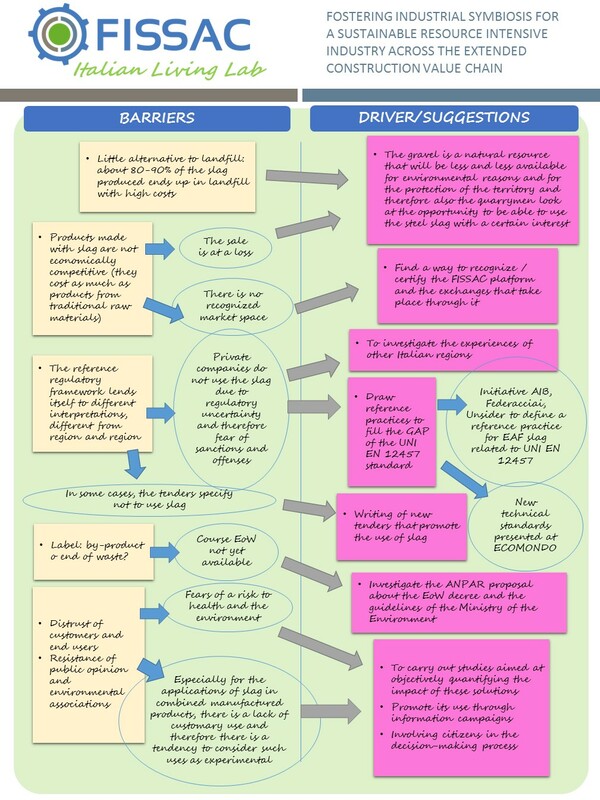 In particular, the First Living Lab aimed to gather feedback from different involved stakeholders in such a way that their experience, difficulties and needs could be used to optimize and validate the FISSAC model. The event bought together various exponents of Brescia Industrial reality, mainly related to the steel, cement, and concrete sectors, together with builders, university representatives and other professionals linked to these realities. The common objective and starting point was the desire to investigate opportunities for industrial symbiosis, with particular reference to the reuse of steel slag from EAF. The FISSAC project and its objectives, together with a general overview of the activities carried out so far in the project, were presented. 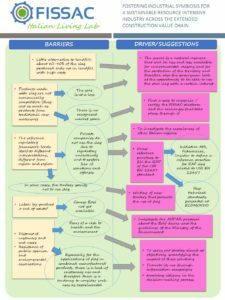 To start the debate, the results of the research on non-technological barriers, carried out by the project partners, were illustrated. 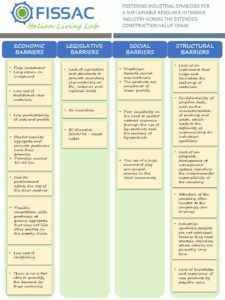 The barriers were presented divided into four categories (economic, legislative, social and structural), and together with them some possible solutions were proposed to overcome them. 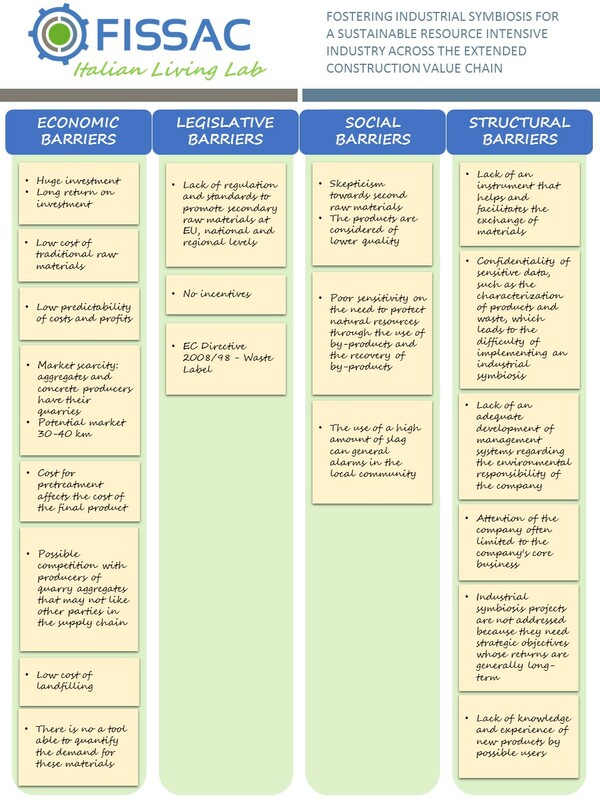 These barriers are shown in Figure 1. The stakeholders were asked, starting from this preliminary list used as a starting point for the discussion, to provide feedback, based on their daily experience, in order to identify the main obstacles encountered in the Italian situation, and to identify together potentials mitigation actions. What has emerged is that the participants of the event have long looked with interest to the theme of the circular economy, and study how to establish processes of industrial symbiosis in their realities. This need arises not only from the desire to make their processes more sustainable, but also from the awareness that the gravel of a quarry is a natural resource, which is expected for the future an increasingly limited availability of excavation due to environmental and protection aspects of land, and that the reception capacity of landfill sites will always be smaller. This leads companies to look for alternative solutions: steel mills are trying to reduce the amount of waste to be disposed of, and quarry workers and manufacturers of construction materials are looking for new alternatives to gravel, especially for less noble applications such as road foundations. From this first comparison, however, it immediately became clear that, despite the desire to move to a circular economy, the industries of Brescia are often faced with bureaucratic-legislative difficulties, which make the re-use of steel slag a complex and not feasible option. This, according to the participants, is the main reason why a large part of the produced slag ends up in landfills. On the basis of current regulations, steel mills are generally currently operating waste as a waste or by-product, and based on this decision, the regulatory framework changes completely; the End of Waste route is a road currently not yet viable, since there are still no directives concerning steel slag. However, according to the participants, the regulatory framework is not clear, but rather subject to different interpretations and applications that vary from region to region: even different dates of disposal/recovery can lead to different regulatory scenarios and different interpretations. Hence the need to standardize the interpretation of the regulatory framework and related technical standards to the greatest extent possible. In this sense, AIB in collaboration with Federacciai is carrying out, through Unsider, the proposal for a reference practice for steel slag aimed at better defining the methods for preparing samples to be submitted to the release test according to the UNI EN 12457 standard. Other proposals, aimed at a more specific definition of the tests for the slag as a by-product to check its environmental compatibility and based on criteria and methods used at the level of European product registration (REACH), have already been discussed with the competent bodies. In addition, at Ecomondo 2017 (International Fair for the recovery of materials and energy and sustainable development), the new technical standards were recently presented (on the use in concrete and combined materials), to try to facilitate companies in undertaking this path. The difficulties encountered by companies, however, are not just laws and regulations: another obstacle that companies often face is having to overcome the distrust of customers, who often still consider the reuse of slag as an experimental application (e.g. inside concrete or asphalt). Based on experiences in the Brescia area, public commissions show that they do not appreciate this material, since it is almost impossible to find it in public tenders: it can even be specified that the slag cannot be used or at the limit included only in small percentages (10-20%). This fact obviously limits considerably the possible applications of this product, which could instead be encouraged in new specifications that enhance and promote the use of recycled materials, such as slag, in combined or uncombined manufactured products. On the other hand, this road is currently already taken in other regions, where it is accepted by large commissions, especially because of an actual lack of natural materials. The distrust of customers could be, at least in part, also fueled by the resistance of public opinion and some environmental associations. To overcome this difficulty, it could be useful to carry out studies aimed at objectively quantifying the impacts/benefits of these solutions, promoting their use through information campaigns and involving citizens in the decision-making process linked to their implementation. In this regard, the University of Brescia is already moving in this direction, with the aim of increasing the volume and solidity of the studies supporting the re-use practices of steel slag. If these barriers, often encountered by the participating industries, could be overcome, the entire annual production of EAF slag from the Brescia area could find a market, for example, in concretes, cemented mixtures and asphalts. In fact, there is no problem of volumes, but the lack of a recognized market space, deriving from a consolidated willingness to accept this material. The interchange platform that will be developed within the FISSAC project could at least partly respond to this need, especially if we could find a way to recognize or certify the exchanges that take place through it. Technological barriers are not considered as relevant by industrial stakeholders, since the use of EAF slag from steelworks in concrete or asphalt is now rather technologically tested, given that an adequate level of specialization it is always necessary to use this type of material. The only aspect that could create difficulties is that the products made with the slag weigh more (up to 30% more than the natural material) and therefore have a lower volumetric yield compared to the use of natural inert. This aspect has a greater impact on transport and must be taken into consideration also from a structural point of view; these materials are in fact more suitable for non-suspended horizontal applications, in which they can be used up to 90% and result also more resistant to wear and impact, while they are less suitable for applications that develop vertically and in height due to the higher specific weight of the artifacts. In general, the challenge of competitiveness from an economic point of view remains open; the realization of a quality product currently leads to a final cost approximately equivalent to products made with traditional raw materials. This is one of the reasons why private companies hardly choose the products made with the slag. Also from the point of view of the slag producers who directly certify it as a building material, the cost of transport is certainly a critical factor for the sale. The topics discussed during the meeting are summarized in Figure 2. In conclusion, the main need identified by the participants in the Living Lab is to provide greater clarity in the regulatory framework and uniformity in its interpretation, so that the process of industrial symbiosis is not inhibited, due to bureaucratic-legislative difficulties. At the same time, the stakeholders also described other problems encountered rather frequently in this context: the distrust of public opinion and customers, the criticality of the economic aspect and the lack of a recognized market space. The technological aspect, although presenting some difficulties, is considered less critical by the participants in reference to the reuse of the EAF slag, since there is now a good number of practices tested for the industrial symbiosis with the production of concrete, mixed cement and asphalt. For the future, the participants have shown interest in extending the comparison to other regions, to assess if and how these difficulties have been faced in other contexts, and to further investigate the FISSAC project and in particular, the platform that will be implemented, to evaluate if this tool could meet their needs. A Living Lab is a privileged space in which participants share and co-create knowledge with the aim of seeking innovative solutions that respond to common needs. Within FISSAC, the organization of Living Labs in the 9 countries, represented within the project, is foreseen, including Italy, where several events will be organized with the aim of investigating the local context and defining together the most appropriate strategy to promote industrial symbiosis, tackling the main challenges for its establishment. The Italian Living Labs are organized and managed by RINA Consulting S.p.A.